About the interviewee: Paul De Wit, an RRI Fellow, is an expert in land tenure reform with over 30 years of experience and working on land policy analysis and reform processes in 20 countries in Africa, Latin America, and Europe. (Read Paul’s full biography here.) Lindsay Bigda, the interviewer, is a Senior Officer for Communications and Advocacy at RRI. The views expressed here are those of the interviewee and do not necessarily reflect the views of the Food and Agriculture Organization of the United Nations (FAO) or those of the European Union. Q: What is the current program you are working on? I am employed as a policy facilitator under the EU-FAO partnership called “FIRST”—Food Security and Nutrition Security Impact, Resilience, Sustainability, and Transformation. The main objective of FIRST is to support the implementation of SDG2—end hunger, achieve food security and improved nutrition, and promote sustainable agriculture—at the country level, working together with government as our main partner. We work directly with Myanmar’s Ministry of Agriculture, Livestock, and Irrigation (MoALI). The causes for malnutrition in Myanmar are multiple and complex, and include limited availability and access to a diversified basket of nutritious food stuffs; poor education and literacy on dietary and health issues, especially for women; poor sanitary conditions; and overall poor health. Our interventions focus mainly on how the agricultural sector can contribute by making nutritious food available at the local level; income generation to access these food stuffs; food safety issues; and some education on nutrition through agricultural extension (providing information and messages to households and farmers on how to use good practices) and awareness-raising work. We believe that there are a series of agricultural- and land-related policies that are not at all conducive to improving the nutrition and health situation of the people of Myanmar, or that may even have a causal effect on the current situation. Q: What is the current food security / nutrition situation in Myanmar? A typical Myanmar diet lacks balance and diversity. Rice accounts for some 60-65 percent of people’s diet. Beans and pulses are another major crop, though for a number of reasons these are exported, especially to India, rather than consumed. Cheap, low quality, imported palm-oil substitutes for local oilseed products. In fact, cheap processed fast food is increasingly abundant, even in remote rural areas. Although major improvements were achieved over the last 10 years, the country has high levels of malnutrition, anemia, and stunting. The prevalence of stunting in children of less than 5 years is still 31.6 percent in rural areas and up to 41 percent in certain states. Some 57 percent of pregnant women and 46 percent of non-pregnant women have anemia. This phenomenon—of high stunting and anemia rates, overall malnutrition, an unbalanced and rice-dominant diet, and a focus on the development of the rice sector—is one that can be seen across Southeast Asia, similarly occurring in countries like Laos and Cambodia. So, the question becomes how these countries can create an enabling environment for producing and making available the necessary ingredients for a more diversified and nutrient rich diet. This includes creating conditions for generating more stable and risk-mitigated incomes to be able to regularly purchase the necessary food products for a diversified diet—and thus increase overall wellbeing. Q: What has been the government/policy response to this issue? Is there a policy environment to address this? 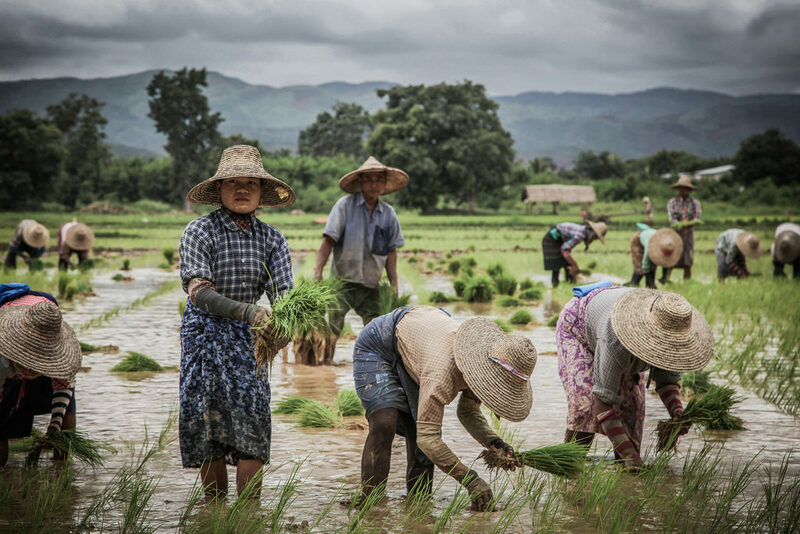 Over the last 50 years or even longer, Myanmar has focused mainly on paddy rice cultivation as a major cash crop. Myanmar developed as the major “Rice Bowl” of the region, as well as its major rice exporter. Rice production has absorbed most of public expenditure in the agricultural sector, whereas investment for producing food and cash crops in agroforestry systems remains marginal to non-existent. There is also overwhelming evidence that rice productivity in Myanmar is much lower and less competitive as compared to neighboring countries. Farmers’ net income from paddy production in Myanmar is less than half of that in Cambodia and Vietnam and less than one-fifth of that in Thailand. In addition, the current rice-based farming systems generate significantly less cash in the pockets of smallholders as compared to most other production systems, such as those based on beans and pulses, oilseeds, aquaculture, and a wide range of other smallholder cash crops. This public expenditure divide also corresponds with a socio-political divide. Major rice producing areas cover a central strip of Myanmar, which are mainly inhabited by the Bamar people (the dominant ethnic group in Myanmar). Undulated and hilly peripheral areas, with major parts under forest cover, are inhabited by a multitude of other ethnic groups. Several of these areas, such as Kachin state, and large parts of Shan, Kayin, and Kayah states—remain socially unstable and ethnically claimed. The Ministry of Agriculture, Livestock, and Irrigation (MoALI) in Myanmar has responded to the nutrition challenge by focusing on a diversified “Food Basket,” rather than on a continuation of the “Rice Bowl” agricultural policy. The country has a very rich and diversified land and natural resource base, covering a multitude of agro-ecological zones that each have potential to produce nutrient-rich foods. This includes aquaculture in delta/coastal areas and on low lying paddy fields; beans/pulses in drier parts of the country together with livestock production; and diverse vegetables, green leaves, and fruits in more hilly areas. There is also a large potential for smallholders to produce high-value cash crops for income generation such as coffee, cardamom, pepper, chilies, turmeric, onion, garlic, mango, ginger, elephant foot yam, etc. Many of these crops are integrated into agroforestry systems in upland and hilly areas, currently managed under customary land systems. Income generation is also important, as households mainly rely on markets to provide them their daily food basket. This new “Food Basket” policy is translated into a new “Agricultural Development Strategy-ADS,” which was officially launched on June 7, 2018 and now stands as the strategic reference for the development of the agricultural sector. Q: What are the links between land reform, food security, and nutrition? Myanmar is an interesting example to demonstrate these linkages. FIRST research makes it clear that the current legal land framework significantly hampers the implementation of a Food Basket policy and thus the Agricultural Development Strategy. In fact, the current framework, including the Farmland Law from 2012, is more of a regulatory framework to enforce rice production. Neither the Farmland Law nor any other law unequivocally secures tenure over lands that are not legally classified as “farmland”—a term that is narrowly defined and refers exclusively to land that is permanently cultivated, often with a single crop. These include systems that hold immense potential to contribute to dietary diversity, including village grazing lands, fishponds, most agroforestry systems, and different forms of shifting cultivation. Most lands and resources in these systems are customarily managed. Thus, major reforms are needed to achieve the official recognition of customary land systems, and the acceptance of legal tools to provide legal tenure security over these lands. A failure to legally recognize customary land tenure is detrimental for promoting more dietary diversity at the local level. The Farmland Law drives farmers away from diversification rather than encouraging it. This is especially true for those who feel that their rights are insecure in practice. For example, those with agroforestry holdings may want to convert them into permanent single cropping fields; those in need of seasonal credit may want to turn to permanent rice cultivation. Indeed, farmers cultivating rice can receive a seasonal loan that is fivefold higher than farmers cultivating any other crop. Because customary systems are not being officially recognized, these lands also continue to be legally classified by the government as “fallow or virgin lands.” The Vacant, Fallow and Virgin Land Law (2012) serves the exact role of allocating these lands to private investors and companies. As a result, subsequent land allocations result in major conflict between communities and companies—one dimension of land grabbing. Hence, whereas a new agricultural strategy has been adopted to diversify the food and income generation basis for smallholders, the strategy itself needs a new land regulatory framework in order for the rural poor to benefit from it. Q: What are some of the institutional challenges in Myanmar with respect to nutrition, food security, and land reform? Several government ministries work on nutrition, but there has not yet been a true holistic response. As in so many parts of the region, the Ministry of Health and Sports (MoHS) takes the lead on nutrition in Myanmar—using a rather clinical approach. Hence, interventions such as micro-nutrient supplementation, management of infectious diseases, supplementary feeding, and therapeutic programs are, rightfully, priority interventions. In addition to the Ministry of Social Affairs and its social protection interventions targeted at mother and child beneficiaries, the Ministry of Education has a role through school campaigns, school feeding, and nutrition education. Finally, the The Ministry of Agriculture, Livestock, and Irrigation (MoALI) plays a role as the entity responsible for food production, farmland administration, and to some degree food safety. MoHS is very much in the driver’s seat because cost-benefit ratios and the direct impacts of nutrition specific interventions—for instance, micro-nutrient supplementation—are usually easier to calculate and prove, and, consequently, often determined to be the most cost effective. This is a phenomenon that we see regionally as well as in other countries around the world. So, the first part of our work has been to balance this clinical and reactionary approach with an increased focus on the availability and accessibility of a nutrition rich diversified food plate at local level. This approach puts MoALI more strongly on the nutrition table. It also creates the necessary attention for land tenure reform by policy-makers from the health and education sectors, and arguably more importantly, from the Ministry of Planning and Finance that ultimately funds these interventions. Read the second part of this interview here.